School board members have decided now is not the right time to change start times for district schools. While acknowledging the medical evidence and research suggesting that a high school start time of 8:30 a.m. or later would better align with teens’ unique sleep needs, the board unanimously decided to hold off on making a change - at least for now. Read more. The student council at the high school is planning to hold a 17-minute walk out of school on March 14 as part of a national student protest of gun violence. Stillwater Area Public Schools supports students’ right to free speech and peaceful assembly so long as our students remain safe and the activity is done in accordance with district policy. We encourage families to have conversations with their children about their expectations and participation in non-school sponsored activities, including walkouts or other protests. Our normal policies regarding student attendance still apply. Leaving the building may result in an unexcused absence unless parent/guardian permission is provided. How well are we communicating with you? We know how important it is that teachers, schools and the district share information with you on a regular basis. We want to make sure what we are doing is working and if it’s not, we want to fix it! You can help by completing an anonymous, 26 question communication survey. You can access the survey here. It will take about 15 minutes to complete. Want to play a role in helping to ensure our students are ready for whatever life has in store beyond high school? Consider applying to be part of the school board's new World's Best Workforce Advisory. The group will advise school board members on how best to equip our students to be competitive - to be ready for college, trade school, the military or a career. The deadline to apply is March 23, 2018. Apply online. March 13 - College Fair at the high school from 5-7 p.m.
March 14 - The Top Secret Project: This free presentation for adults helps parents recognize unfamiliar hazards of teenagers that are often right in front of their eyes. Begins 6:30 p.m. at the high school. April 6-8 - Stillwater Area High School Theatre Department presents Bye Bye Birdie. Eight teachers and staff have been named recipients of the Partnership Awards! The awards, given by The Partnership Plan, recognize Stillwater Area Public school employees for their dedication, professionalism, and work on behalf of students. The winners each receive $1,000 to designate to the school of their choice. Read more on our website. 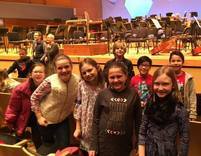 All fourth graders in our schools went to a children's concert at Orchestra Hall. It's the third year in a row that the The Partnership Plan has sponsored the field trip. The students will soon decide if they want to play a musical instrument in fifth grade. The Orchestra Hall visits seem to be having a positive effect on our music program. The percentage of fifth graders playing an instrument has gone up in the last couple of years. See more photos on Facebook. Congratulations to our Stillwater Area High School students who earned awards at Career Skills Day! Fifteen northeast metro schools participated in the event which tests skills in interviewing, general job knowledge and completing a job application. Two SAHS students earned gold awards and two earned silver. See photos on Facebook. Fifth graders at Afton-Lakeland Elementary composed original songs as part of a week-long songwriting experience funded by the PTA. Nashville singer, songwriter & musician Jeff Dayton mentored each class in writing their songs and then accompanied them with his guitar as they performed a concert for students, staff and parents. Listen to one of their original songs. Lake Elmo Elementary students learned about the weather from KARE-11 meteorologist Belinda Jensen. Jensen shared from her “Bel the Weather Girl” series of children’s books. She talked with second and third graders about different weather conditions, including blizzards, hurricanes, thunderstorms, hail, clouds and tornadoes. Jensen even conducted a science experiment making a cloud from water, ice and soot. See photos on Facebook. The school board will hold a work session on the topic of school finance at 6 p.m. on Wednesday, March 28, 2018 at Central Services. The school board will hold a work session for the purpose of gathering more information on the literacy curriculum Thursday, March 29, 2018 from 4:30 – 5:30 p.m. at Stillwater City Hall.